PRODUCT: Safety Vest, Premium-Grade ANSI/ISEA Class-2 Adjustable, Orange Mesh with 2 in. Wide 360 Degree Lime-Yellow Reflector Stripes. Adjustable, fits S-XL. Individually packaged. Price/Vest. SUPER SALE !! QUALITY GUARANTEED. SUPER SALE !! COMPLIANCES: New design meets all ANSI/ISEA 107-1999 requirements (107-3004 testing in progress) for Class-2 safety garments (also meets the requirements of EN471). 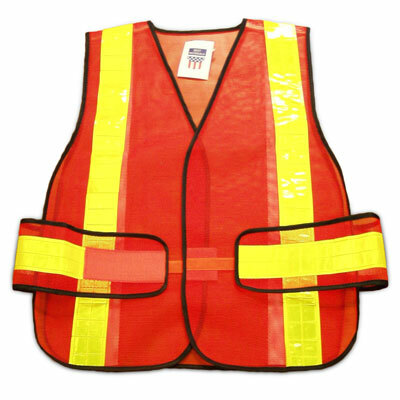 2) Color: Fluorescent orange vest with fluorescent lime-yellow reflector tape. 3) Tape: 1-horizontal and 2-vertical, 2" wide lime-yellow reflective tape stripes. 4) Size: Adjustable XL fits most S to XL sizes over outer clothing and jackets). 5) Adjustable side and front velcro straps for optimal comfort and fit. 5) Adjustable reflective side straps allow for 360 degree visibility with superior comfort. 6) Meets DOT requirements for reflective mesh vests. 7) Weather, water and tear resistant. 8) Rip resistant comfort-mesh polyester fabric. * City and State Outside workers. OPTIONS: We can custom make vests to your specification. (minimum order 1000).